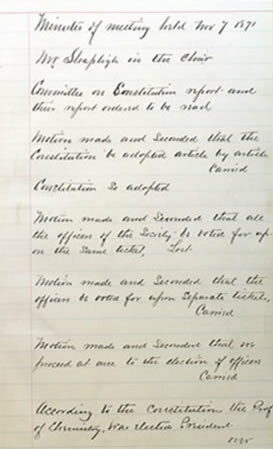 This page shows the Secretary's notes from the first meeting. Chemical Society of Lehigh University. Meeting Minutes Book, 1871- 1893. Formed in 1871 by students and Professor William H. Chandler, the Chemical Society of Lehigh University, kept the member students abreast with the innovations and progress in the field of chemistry by organizing monthly meetings and lectures. The Chemical Society organized annual lecture series and invited prolific figures of the American chemical world to lecture on the recent developments of chemistry, science and technology. This 1875 poster lists the speakers and the titles of their lectures. Note that the Society rented the Moravian Female Seminary's chapel to accommodate the anticipated large audience. 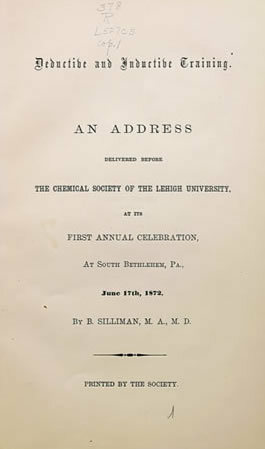 Silliman's 1872 lecture published and distributed by the Chemical Society. 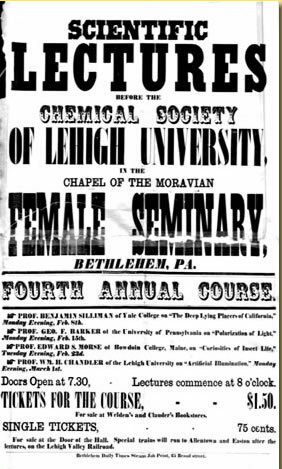 Deductive and Inductive Training: An Address Delivered Before the Chemical Society of the Lehigh University, at Its First Annual Celebration, at South Bethlehem, Pa. June 17, 1872. New York: Stephen Angeli, Printer, 1872. Benjamin Silliman was one of the prominent chemists in petroleum research. His report, "Report on the Rock Oil, or Petrolium, from Venango Co., Pennsylvania, with Special Reference to Use in Illumination and Other Purposes", on the fractional distillation of petroleum is the most influential early work on use of oil in lighting and as lubricant in mechanical parts. Silliman was a professor of chemistry at Yale University and visited Lehigh in 1870s several times for lecturing.